Students head for their buses at York Middle School in this Sept. 14, 2017, photo. Editor’s note: Maine’s statewide test results haven’t really changed for years. So we set out to understand what the state should be doing if it wants to see more young people succeed in school and eventually earn some type of post-secondary degree. This is the first piece in a series, Your School, that examines what is holding back teachers, principals, parents and communities from helping students realize their full potential, and aims to hold up promising efforts that other places might learn from. Along the way, please write to us with questions and ideas for coverage at mainefocus@bangordailynews.com. There’s a characteristic that stands out about state education policy in the minds of many Maine teachers and school administrators: an inability to stick with major initiatives. The inconsistency makes it more difficult for schools to focus on improving student achievement, teachers and administrators say. And it sows doubt in the minds of educators that any major state education initiative has staying power. The test taken by Maine’s elementary- and middle-school students has changed four times in the past decade, from the Maine Educational Assessment to the New England Common Assessment Program to the Smarter Balanced assessment, then back to another generation of the Maine Educational Assessment. During one recent three-year stretch, the exam changed each year. The lack of a consistent test has made it difficult to measure how Maine students’ performance has changed over time, and it’s contributed to the commonly held sense that the state lacks a focused way of improving student achievement. The history of public education in Maine over the past three decades contains several other major initiatives in which the state and local school districts invested substantial energy only to later abandon them or change course soon after. In a 2011 survey of Maine school principals conducted by the University of Maine’s College of Education and Human Development, a number of educational leaders called for a sustained focus and said school districts, and state and federal governments, needed to stay the course. As educators in Maine’s schools have implemented this churn of initiatives in recent years, the state’s academic performance has largely held steady as other states have improved and closed the gap with Maine. In 1998, for example, Maine fourth graders’ average reading score on the National Assessment of Educational Progress was 225, 10 points higher than the national average. By 2015, Maine’s average score had slipped to 224, and the rest of the nation had nearly caught up, posting an average score of 221 on the nationwide test regularly administered to samples of students in each state. Maine was among the first states to work on developing statewide academic standards, which lay out the expectations for what students should know in each subject area at each stage of their education. But the state hasn’t always stuck to the same student benchmarks for prolonged stretches, and Maine’s drive to ensure students are meeting those expectations as a condition of their high school graduation has led to a number of false starts. Academic standards became the law in 1997, when the Legislature adopted the Maine Learning Results, a uniform set of standards that would apply to every public school student, developed with the input of teachers, business leaders and many others. The state’s standardized test, then the Maine Educational Assessment, would test students’ mastery of the standards. Local school districts were to develop their own testing tools — combinations of student projects, portfolios and exams — that would determine whether students had met the expectations laid out in the Maine Learning Results and were eligible to graduate. The stumbling block was implementation. The locally developed measurements of student progress, known as “local assessments,” proved an unwieldy part of the standards law. Today, local assessments stand out as an initiative in which the Maine Department of Education and the state’s public schools invested substantial energy, only to later abandon the effort. The state later delayed the initiative’s start date, and the Maine Department of Education began offering examples to help along local school districts’ development of their own local assessments. “It had become this giant monster that was consuming everyone’s time to the point you weren’t able to teach because you were being pulled out of the classroom to sit around a table and design these tests,” Blakney said. In 2006, nearly 10 years after the Maine Learning Results law set the development of local assessments in motion, the Baldacci administration imposed a moratorium on the initiative. In early 2007, then-Education Commissioner Susan Gendron announced the Department of Education was pulling the plug, leaving school districts without a common way of ensuring students actually met Maine’s academic expectations before completing high school. Eliminating the local assessments would allow teachers to devote more time to instruction, Gendron said at the time, according to a BDN article. The local assessments that school districts had deployed, she said, had become cumbersome and ineffective, had “shown only minimal value,” and were “unrealistic.” One Maine high school cited by Gendron had come to require 130 assessments in social studies. “If we’re going to move beyond the plateau our education results are showing, we need to focus more in the classroom,” Gendron said. As Gendron announced the Baldacci administration’s plan to end local assessments, the administration was preparing its push for another major education policy initiative that local school districts would invest substantial energy in implementing, only to later see it effectively reversed. Districts with fewer than 2,500 students had to find merger partners or else face penalties in the form of reduced state school aid. Along with the consolidation mandate, the budget passed in 2007 included a $36.5 million statewide cut in school spending as state revenues lagged in advance of the Great Recession. School boards and administrators occupied themselves with the search for merger partners and working out the particulars of their unions, from determining each town’s share of expenses to working out the assumption of individual towns’ existing school debts. The school district consolidation law survived a repeal attempt at the ballot box in 2009, and, by the 2011-12 school year, the number of school districts in the state had dropped by more than 40 percent to 164. But the law’s main enforcement mechanism, financial penalties, disappeared the next school year as the result of legislation signed by Gov. Paul LePage. A number of school district mergers began unraveling soon after. 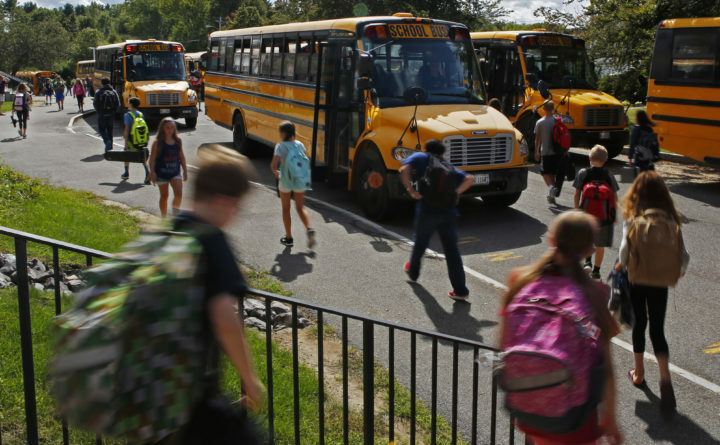 Since 2012, 33 towns have withdrawn from their multi-town school districts; 40 others have either tried and failed, or are considering withdrawal, Maine Public Radio reported earlier this year, citing the Maine Department of Education. Throughout his administration, LePage has called on school districts to consolidate to cut down on administrative spending, and has said the Baldacci-era consolidation proposal didn’t go far enough. But the Republican governor has stopped short of a wholesale consolidation policy like his predecessor’s. In the LePage administration’s most concrete step taken to trim administrative costs, the state budget signed into law earlier this year calls on school districts to form regional partnerships to provide some services collaboratively. Over time, the budget decreases the amount of state aid provided to individual school districts for system-level administration. In the 2020-21 school year, only school districts that have joined with neighboring districts to provide regional services and districts identified as “high-performing” and “efficient” will qualify for state aid earmarked for system-level administration. The years since 2007 have been characterized by a volley of changes for Maine’s public schools. — In 2007, the Maine Learning Results underwent their first major update since becoming part of state law 10 years before. Over the next couple years, at least two Legislature-authorized working groups of educators and school officials wrestled with how to measure whether Maine high school students knew their material well enough to graduate. Blakney, the math teacher at Waterville Senior High School, served on one of these groups as a Maine Education Association representative. — But Maine’s standardized test, used to gauge whether students had learned the required academic skills, was in for a change. In 2009, Maine dropped the Maine Educational Assessment, which it had been using for more than a decade, in favor of a standardized test also used by New Hampshire, Rhode Island and Vermont. Switching to the New England Common Assessment Program meant the state had to change the specifications of what students should know; it tweaked the Maine Learning Results accordingly. — In a sign of how much influence the federal government can exert over state education policy, the Maine Legislature, at the Baldacci administration’s urging, made a number of policy changes in 2010 designed to better position Maine to compete in the national Race to the Top education reform competition. States had a shot at a portion of $4.35 billion in federal education funds if they could demonstrate they had rigorous academic standards, that their schools were constructively evaluating the performance of their teachers and principals, and that they were encouraging educational innovation. To prepare for the competition, Maine set in motion another change to its academic standards and the standardized test used to determine whether students were meeting them: The Legislature took its first steps in the spring of 2010 toward adopting the Common Core State Standards, which were then under development by a national organization representing state education chiefs and the National Governors’ Association. The Baldacci administration also became an early participant in a coalition of states working to develop a test based on the Common Core standards, called the Smarter Balanced assessment. In addition, at the same time as the state prepared for another change to its standardized tests, lawmakers approved a policy in 2010 allowing school districts to use student performance data from standardized tests as a factor in evaluating teachers’ performance. In its 211-page Race to the Top application submitted to the federal government in June 2010, the Maine Department of Education touted a long history of educational innovation. It spoke of some successes in the form of long-standing policies such as the Maine Learning Technology Initiative, which equips students in middle and high school with laptops and trains teachers on using technology in learning; and Jobs for Maine’s Graduates, which offers programming in high schools across the state for students at risk of dropping out. It also spoke of a handful of new reform initiatives that individual schools were piloting. But only 38 percent of school districts signed onto the state’s unsuccessful Race to the Top application as participants in the work. Judges scoring state applications weren’t convinced that Maine’s long history of different educational initiatives had translated into improved student performance. “No direct connections between interventions and student achievement increase were described that would indicate that the planned interventions would result in improved outcomes,” read the judges’ Maine score sheet. Maine finalized its adoption of the Common Core State Standards in 2011, LePage’s first year in office. The switch to a new state standardized test took place during the 2014-15 school year, when Maine became one of 18 states to use the test that year. Ultimately, as students, parents and teachers registered their objections with state legislators, 2014-15 became the only year of Maine’s participation in the Smarter Balanced test. The next year, Maine was back on its own, with a new version of the Maine Educational Assessment — the third test in as many years. Meanwhile, schools have been working to implement the major educational policy initiatives of the LePage era. In 2012, the Legislature passed, and LePage signed into law, a policy requiring that schools ultimately award students “proficiency-based diplomas.” In other words, students are only to receive their high school diplomas once they’ve demonstrated their mastery of the state’s academic standards, as opposed to earning credits based on completing a year of coursework. Proficiency-based diplomas are another attempt at bringing the implementation of the Maine Learning Results full circle, said Albanese, who is now a senior policy adviser at the Great Schools Partnership, which has worked with school districts across New England on education reforms. In some districts, the transition to proficiency-based diplomas means teachers have changed the way they teach, making instruction more project-oriented and individualized to students’ learning styles and the pace at which they learn. Elsewhere, it hasn’t yet brought about a fundamental change. In response to a BDN survey sent to teachers through the Maine Education Association, teachers commented on the uneven nature of implementing proficiency-based education across the state. A number of teachers said the initiative was helpful, but they had doubts about its staying power. In Waterville, Blakney said implementing proficiency-based education is a lot like the local assessments of two decades ago. Since Waterville Senior High School is still transitioning from a traditional, credit-based diploma to a proficiency-based diploma, Blakney grades her Algebra I tests for both systems. She calculates a traditional grade on a 100-point scale, then evaluates the exams to determine whether students have mastered the academic standards the exam was testing. Blakney and her math department colleagues spend much of their time devoted to training to ironing out the particulars of the proficiency-based diploma requirements. Meanwhile, she said, she hasn’t received training on actually changing how she teaches — making the switch from lecturing to allowing students to work at their own pace, for instance. She could also use some training, she said, on how to teach children who are homeless and have suffered traumatic childhoods. In addition, this school year is the first during which school districts have to have new performance evaluation systems in place to measure the job performance of their teachers and principals. Under the state law first passed in 2012, the state requires that districts base their performance evaluations in part on student achievement data from the Maine Educational Assessment that students will take for the third consecutive time this school year. As a result of the new focus on evaluations, Blakney said she’s focusing more on showing students how the lesson they’re learning fits within a bigger picture. One teacher who responded to the BDN’s teacher survey said the evaluation systems have meant teachers have substantially more paperwork to complete. “I feel like I spend more time talking and writing about what I am teaching than actually teaching!” the teacher wrote. The evaluations are also a significant new responsibility for building principals, who are charged with spending time in teachers’ classrooms and judging their performance against the criteria set out in the district’s evaluation model.